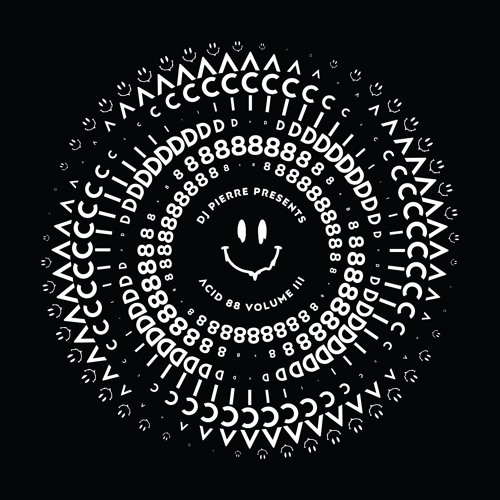 Artist: DJ Pierre Presents / Various Artists Title: Acid 88 Volume 3 Label: Afro Acid Plastik Release Date:	April 13, 2019 (Record Store Day) Cat. No: AAP018 A double LP of 1 Black + 1 White vinyl of 12 killer acid trax selected by legendary pioneer DJ Pierre featuring Mark Archer, A Guy Called Gerald, K’Alexi & Tony Lovelesss, Lauren Flax, Hiroko Yamamura, Alinka, Acidulant, Jaquarius, Ali Berger, Type-303, Hunter Lombard, and Beyun. Available Record Store Day: Saturday, April 13th. In 1987 the first Acid record, “Acid Tracks”, was released by the Chicago group Phuture—DJ Pierre, DJ Spank-Spank and Herb J—who thought to twist the knobs on the Roland TB-303 in such a way that it created an entirely new (and at that time, totally bizarre) instrumental sound often described as “squelchy”, trippy, and psychedelic (showing that music could be a powerful drug all by itself). The legendary Ron Hardy, a resident DJ at the Muzic Box in Chicago, gave this strange track a listen and played it not once but four times on the dance floor until it created a frenzy. News of the Acid “squelches” quickly spread around Chicago and then across the Atlantic, inspiring the next wave of pioneering Acid artists—A Guy Called Gerald, K’Alexi, Mark Archer (Altern 8) are among them—to create Acid tracks of their own. This sound, now known as Acid House, laid the foundation for a youth movement in the UK known as the Second Summer of Love (1988). It was this movement that spread across Europe and the world, becoming the rave and festival scene we know today. Acid 88 celebrates the origins of Acid House by featuring a selection of new Acid tracks from legendary artists and fresh, rising talent. Together these tracks showcase the breadth and depth of Acid—from house to techno, from jackin to deep. It is also a tribute to the life and legacy of DJ Spank-Spank—may he rest in power.